We are committed to more sustainable asphalt mixes by allowing higher percentages of RAP (Recycled Asphalt Pavement) and RAS (Recycled Asphalt Shingle) in conjunction with using warm mix technology and maximizing our relationship with NCAT (National Center for Asphalt Technology). Did you know that asphalt happens to be one of the most recycled and sustainable products on the planet? In the US, the use of recycled asphalt and shingle results in $3B+ savings compared to the cost of new raw materials. We work diligently to adhere to the LEED guidelines and specifications. We decrease the need for new virgin asphalt binder by utilizing RAP and RAS in our asphalt production, thus minimizing landfill use. With sustainability a top priority, we continuously innovate and use the latest technology to protect our environment. 99%+ of the material we removed from old asphalt pavement roads is reused in new pavement. New technology such as porous asphalt pavements and other mixes can help with storm water management and keep pollutants out of the environment. GREEN CONSTRUCTION IS HERE TO STAY AND WIREGRASS IS PROACTIVE IN ITS USE. 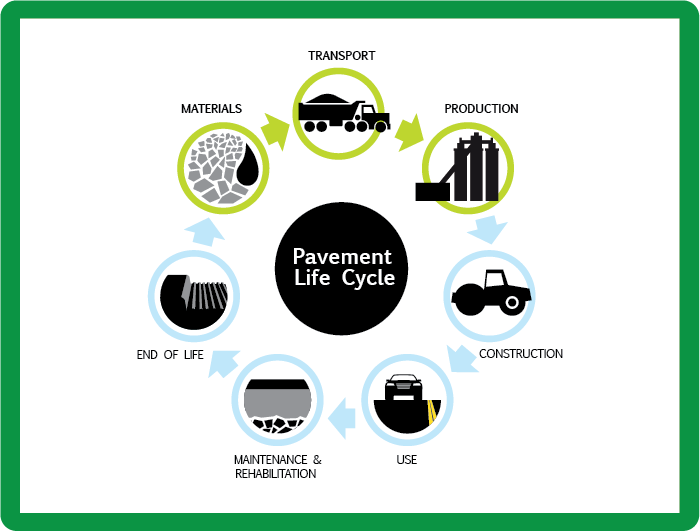 From the production of the paving material, to the placement of the pavement on the road, to rehabilitation; through recycling, asphalt pavements minimize impact on the environment.